In the world of business, presentation is very important, and not necessary limited to how well an idea is executed, but how well a person presents themselves while making the pitch. Everyone knows that it is important to have the right suit but what about the right accessories? Even in the days of laptops and mobile devices, leather presentation portfolios still have their place in the board room. Not only do they help to keep your papers organized but they are something that will be noticed by all present in the room. 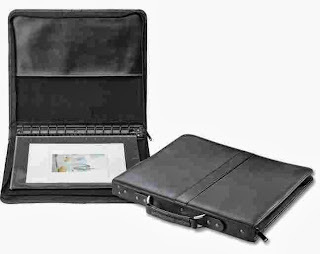 Good leather presentation portfolios will make an impression that will last long after the presentation is finished. Imagine that you going into the board room and it is time for the presentation. The first presenter starts pulling out piles of wrinkled and folded paper. As the presenter tries to get organized, everything falls to the floor. After the presenter gets organized, the presentation begins and it is a stellar presentation. The next presenter pulls out their leather portfolio and within it is a neat and organized stack of papers and begins his presentation. Their presentation is a great presentation as well, but maybe not as stellar as the first one. However the board decided to go with the second person. Why? The second person was organized and gave the lasting impression that they cared about what they were presented. Not only was their presentation good but they looked good too. In business, looks are not everything, but they are an indication of the manner in which a person regards themselves and their work . Everyone remembers to bring some sort of electric device to a meeting. They are the way of the world. However the small detail of a leather portfolio is an added detail that will not be overlooked. It is a way of showing off to a client or an employer without hitting them over the head. It is a way of showing that the job is important and that all means to protect it have been taken. dog-eared, and highlights the fact that not only are you organized, but that you do it with class.